BY MALIA ZIMMERMAN – McDonald’s Restaurant celebrated its past and future coming together Tuesday night with the grand opening and Hawaiian blessing for its new Aina Haina restaurant. Located in the Aina Haina Shopping Center, the new one-story restaurant is just steps away from where the very first McDonald’s was launched in Hawaii on November 2, 1968, by Maurice “Sully” Sullivan – the successful entrepreneur who also founded the Foodland grocery store chain and brought Dunkin Doughnuts to Hawaii. Glenn Waki, who now owns the Aina Haina restaurant with his wife Colleen, started his career in April 1972 as a manager trainee at that Maurice Sullivan’s McDonalds of Aina Haina. The original McDonalds built by Sullivan still stands, but will be torn down after the new McDonalds officially opens to the public on Thursday. Maurice Sullivan’s daughter, Kitty Sullivan Wo, wife Joanna Sullivan, and son-in-law Roger Wall, were honored at the event. Kitty spoke of the day her father’s entrepreneurship: “It was 42 years ago that my father, Maurice ‘Sully’ Sullivan, brought the McDonald’s franchise to Hawaii and opened the first restaurant here on November 2, 1968. … Countless hamburgers, French fries and milk shakes were sold; the lines stretched across the parking lot. Little did my father know how successful his newest venture would be. In fact, Ray Kroc (McDonald’s Founder), wanted to buy the franchise back right then and there.” Maurice also went on to found the Ronald McDonald House in Hawaii, she said. Veronica Kaneko, president and managing director of McDonald’s Restaurants of Hawai‘i Inc., noted that McDonald’s started with the “pioneering spirit” of Sully Sullivan and his corporate partner, Fred Turner and now is 85 restaurants strong in Hawaii. Kaneko also started her career at age 17 at McDonald’s and rose to the region’s top corporate position. “You can see when you look at our building, our dining rooms and our menu, we are no longer the same McDonald’s of yesterday. But what we stand for has not changed. Quality, service, cleanliness and value are still the heart and soul of our business. We still live by the values and guiding principles as we did 43 years ago, on that first day of business, November 1968. We believe in giving back to the communities in which we do business. No one demonstrated this with such generosity as Sully did. 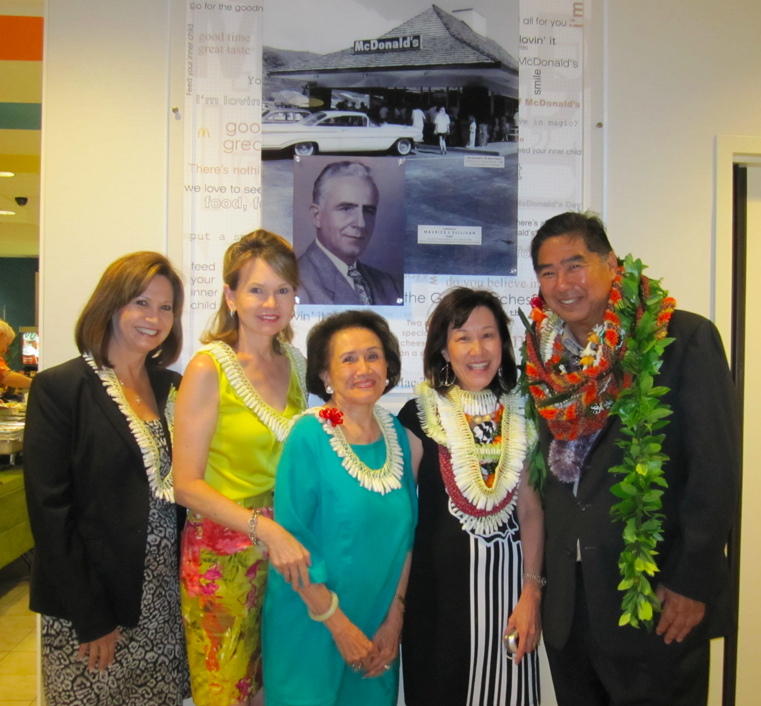 In fact, he left a legacy of giving that is not only with McDonalds and Foodland, but with every successful company in the state of Hawaii,” Kaneko said.